Gießen, October 18, 2016 - The California Walnut Commission is pleased to inform us that our proposal, “Effect of Walnuts on Mitochondrial Function and Cognition in a Mouse Model of Aging” has been approved in the total amount of $100,000 US. This study aims to tests the overall hypothesis: A feed supplemented with walnuts in combination with cognitive and physical activity (WalNutA²) supports healthy aging by improving motor, cognitive, and mitochondrial function in a mouse model of brain aging. Motor and cognitive functions will be measured using behavioral tests. Mitochondrial function will be assessed using state of the art techniques including ATP levels, mitochondrial respiration and oxidative stress. It is proposed that WalNutA2 reduces age-related cognitive and motor impairment in aged mice as assessed by neurobehavioral and motor testing including assessment of working memory. Enhanced neuronal plasticity might be one of the underlying mechanisms that will be monitored by measuring synaptic marker proteins and the determination of BDNF levels. 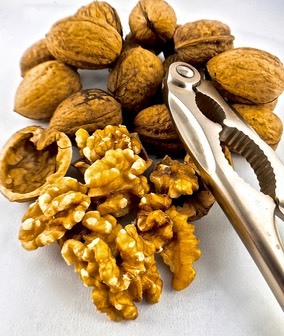 A detailed examination of relevant pathways including neuroinflammation using qRT-PCR will enlighten the molecular basis for the beneficial effects of Walnut nutrients in combination with enriched environment and voluntary wheel running in brain aging.